Chinese stock plunged another 296.55 points today (8.45%) to 3211.20. The market was once up over 60% on the year in June, but is now negative. I added that last red bar because Stockcharts reflects last Friday. From 3264 to 5178 to 3211 is one hell of a round trip, especially for a stock market index. Bloomberg notes State Support Fails to Stop Rout. More than 750 stocks fell by the daily 10 percent limit on the Shanghai Composite. Economic growth slowed to 6.6 percent in July, according to Bloomberg’s monthly GDP tracker. Stocks on mainland bourses traded at a median 61 times reported earnings on Friday, according to data compiled by Bloomberg. That’s the most among the 10 largest markets and more than three times the 19 multiple for the Standard & Poor’s 500 Index. Yuan positions at the central bank and financial institutions fell by the most on record last month, a sign capital outflows have picked up. Please consider the Vox article China's Latest Stock Market Crash, Explained. 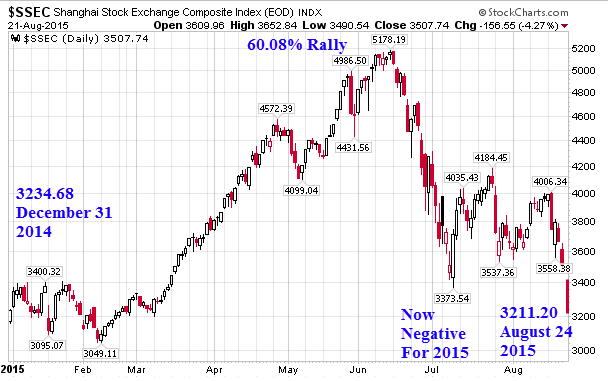 Between June 2014 and June 2015, China's Shanghai Composite index rose by 150 percent. A big reason for the stock market rally was that a lot of ordinary Chinese people began investing in the stock market for the first time. More than 40 million new stock accounts were opened between June 2014 and May 2015. And many have been buying stocks with borrowed money. The Chinese government used to strictly limit this practice, but over the last five years the government gradually relaxed those regulations. Earlier this year, the authorities became concerned that the stock market's rise had become unsustainable. So they began to tighten limits on debt-financed stock market speculation. The stock market peaked in June and then began to fall quickly. That caused regulators to change their minds again. In early July, they made aggressive efforts to push stock prices back up. Those efforts seemed to work for a few weeks, as the market rose and then stabilized. But now it seems that even July's extraordinary actions — which included ordering companies to buy their own stock and banning some executives from selling — weren't enough to prevent further declines. What Vox failed to mention is the boom was fueled by ridiculously loose monetary policy, culminating with a massive real estate boom followed by an equity bubble with kids who did not even graduate from high school, buying stocks on margin. US equities and corporate bonds are also in a huge bubble. There are so many bubbles that one has to be nearly blind to not see them.